A safe way to clean your lenses. 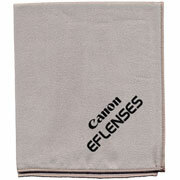 This Canon EF Lenses Microfiber Cleaning Cloth is an ideal solution for keeping your camera and lenses smudge-free. Made from a soft, lint-free material, this heavy-duty cloth features reinforced stitching along the edge for long-lasting performance. This cloth is 100% safe for all lenses, LCD screens, viewfinders, filters and other optics, and easily wipes away fingerprints, dust and smudges without scratching or smearing. And when it's dirty, this cloth can be washed and dried repeatedly for years of use.